Hi and thank you for the great work. The App used to work great but since I host TTRSS on my Synology NAS I always get the error "Network error too many HTTP redirects". Do you have any suggestions, what to do? Sorry, my fault. I had a redirect to https defined in my htaccess. Without it, everything works fine. d1zZy wrote: Sorry, my fault. I had a redirect to https defined in my htaccess. Without it, everything works fine. Thanks for you ios app. APP is very good, but it have some problem, The font is very small. I hope you can adde some function, control the sie of the font. At the same time, I hope there is a night mode function, easy to use in the evening. The size of the font depends on the device. On which device do you find the font too small ? About the night mode, I'll add this to my todo list. Just submitted tiny Reader 1.5.0 to the App Store. 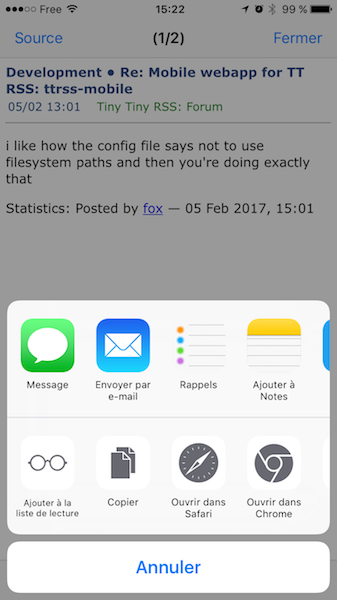 Added the standard sharing panel, so you can share articles with more apps. [UPD] Sharing with mail will now send the full excerpt (as before). [FIX] Fixed a crash when the excerpt does not contain any displayable characters. thanks for the crash fix - this is still by far the best TTRSS app. That said, would it be possible to implement a "night" mode?